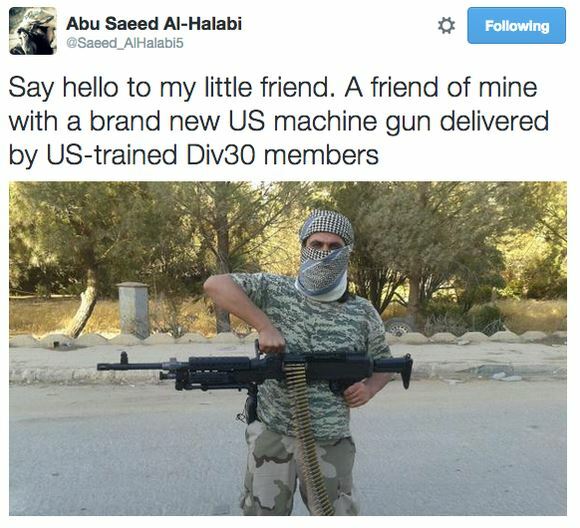 Another Nusra fighter posted pic with his "New toys" which he obtained via Division 30 weapon handout. Militarov wrote: Another Nusra fighter posted pic with his "New toys" which he obtained via Division 30 weapon handout. 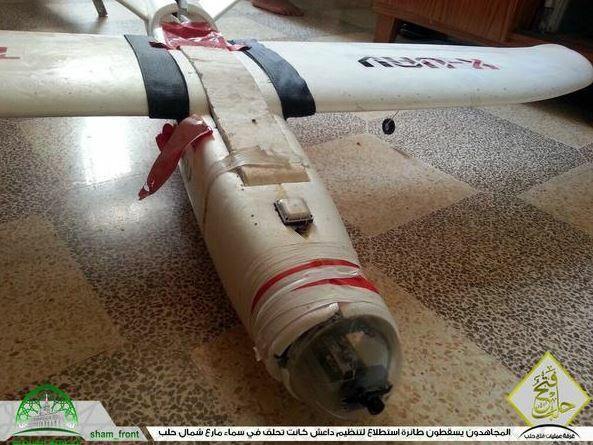 The US arms jihadists to kill Russian people. Americans are bad people. "Drone" in question is X-UAV Talon obtainable online for less than 100$ apparently. "The Talon FPV V-tail Drone is an all EPO moulded airframe. The kit comes un-assembled with EPO and laser cut plywood parts. This version 2 of the Talon has strengthened plywood wing saddle/carbon support parts, and additional plywood pieces for easier FPV equipment mounting. Less guess work on your part. Also, the front wheel plywood mount has been strengthened to survive less than perfect arrivals better. With a 4S 14.8V 10,000mAh LiPoly battery, flight times are long, and wing loading still low thanks to the generous wing area of the Talon. A generous fuselage compartment with large top hatch and removable nose bubble allows you to access your FPV equipment and flight battery in any configuration you choose. It is an open canvas for your FPV needs. • Removable nose bubble for quick access to camera equipement. • Large fuselage compartment accomodates many battery and FPV equipement configurations. Wing Area: 60 sq. dm. I think there must be a plan for a coordinated counter attack, Syrian forces from west, and Kurdish from the north and east, with Russian air cover..
Jihadists are no Ukrainians. They are not afraid to die. They will not stop until you are dead or converted. They stop when they are dead. 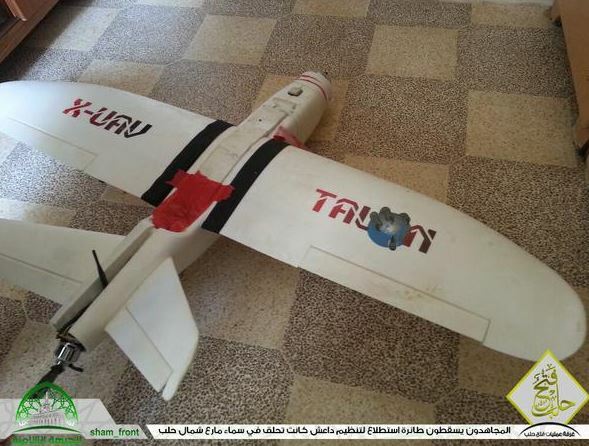 this will be a very good way for the Russians to test some of their tactics and systems... UAVs and UCAVs will be valuable in this situation with Assads forces providing the ground force and air power being used to help I would expect the Iranians and Iraqis and Syrians to all work together to deal with ISIS and Al quada... whether the Kurds help or get in the way will be interesting. I assume Turkey wants ISIS gone more than it wants Assad gone so there is ground to deal there... the issue of kurdish forces might not appeal to turkey, Iran, Iraq, or Syria, but some sort of autonomy arrangement might be agreed to. The FN MAG and FN Minimi are inferior to the PKM... they can have them. POLITE PEOPLE 2: CHEMICAL BOOGALOO!!!!! According to Fox News quoting a high-ranking US official, Russia has demanded that US airplanes immediately leave Syria. Russia, Iran, Iraq, and Syria have recently created an information center in Baghdad in order to coordinate the fight against the Islamic State. The information center’s main goals are to provide reconnaissance on the number of IS militants, their weapons, and their movements. Earlier this week, it was revealed that the new center would begin operations in October or November and be headed by Russian, Syrian, Iraqi and Iranian officers on a three-month rotational basis. So..will there be a chance to see BMPT-Terminator rolls down the Syrian Urbans ? and preferrably in trained Russian hands to mo up those rebel terrorists. Stealthflanker wrote: So..will there be a chance to see BMPT-Terminator rolls down the Syrian Urbans ? Not going to happen because Russia hasn't ordered any BMPT yet. 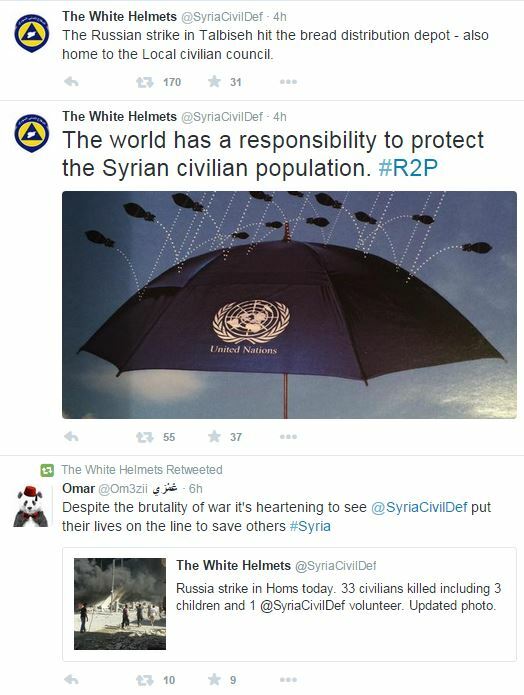 Famous "White Helmets" are "Syria Civil Defence are 2,709 volunteer search and rescue workers from local communities who risk their lives to save others and bring hope. 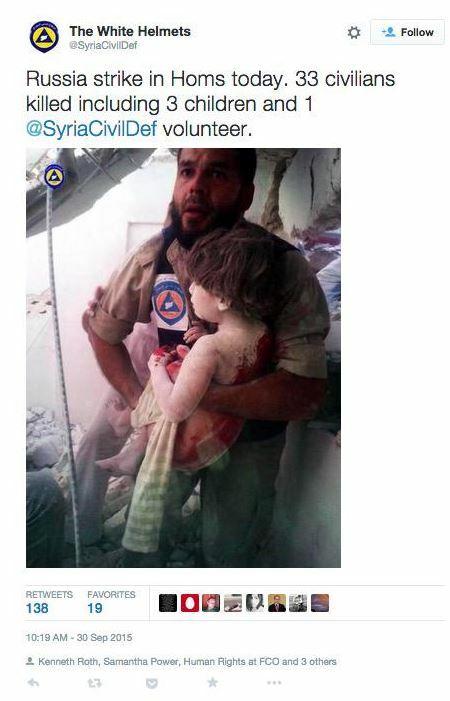 30,000+ lives saved" they apparently have strong ties with Al Nusra judging by their Twitter account and some reports. Their official Webpage: https://www.whitehelmets.org - Quite neat design for someone who is built on volonteur basis in wartorn country i expected 10 lines of HTML and Tables. Seems they are participating in more than just "Humanitarian aid and rescue". In trained Kazakh hands then? Thing is that no more than 10 BMPT-72s were built in total for Russia. I belive 10 was made for Kazakhstan and thats it. Beside few prototypes for state tests none are in existence or actual service. 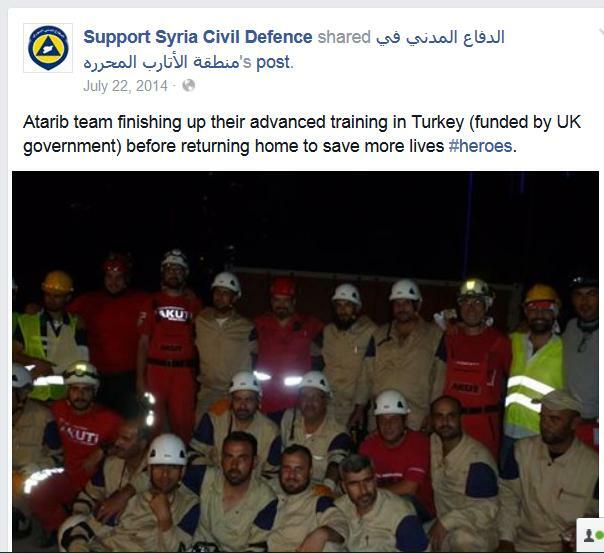 Militarov wrote: Famous "White Helmets" are "Syria Civil Defence are 2,709 volunteer search and rescue workers from local communities who risk their lives to save others and bring hope. 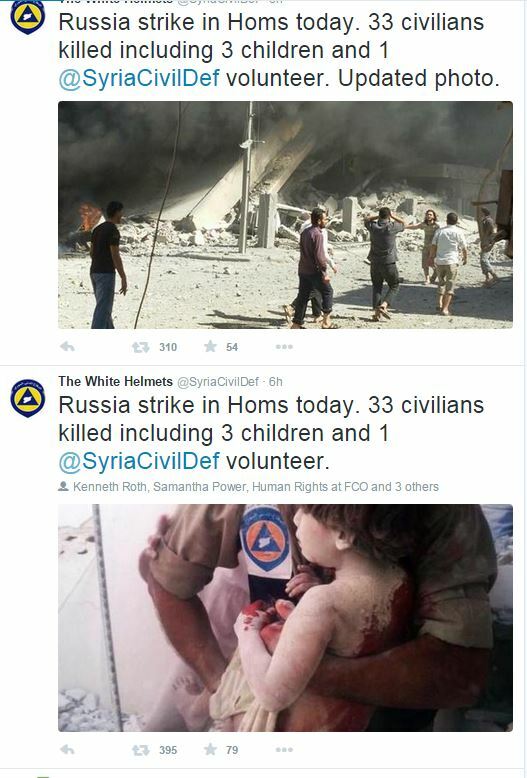 30,000+ lives saved" they apparently have strong ties with Al Nusra judging by their Twitter account and some reports. Good God man!!! Someone should give this man a upvote! 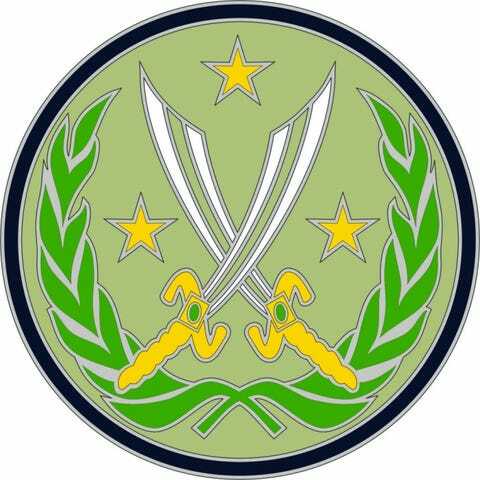 "Believe it or not, American soldiers fighting against ISIS in Syria and Iraq will actually be wearing the emblem of ISIS – the infamous crossed-swords logo. Well, almost. While the Islamic State is using barbaric tactics to remake the Middle East closer to its own vision of a Caliphate, the United States and its allies also seek to remake the Middle East, and use the specter of terrorism to aid in regime change in Syria and elsewhere. The triangulation and cross-purposes are both confusing and aggravating to many Americans." "The US Army has debuted a new shoulder patch that soldiers in Iraq can wear to represent their role in the ongoing fight against ISIS, USA Today reports. The patch features crossed scimitars, three stars, and a palm wreath. According to USA Today, the three stars denote the US land, air, and sea forces involved in the fight against ISIS. The palm wreath is meant to symbolize honor, while the crossed swords evoke the twin goals of the ongoing operations: the defeat of ISIS and the restoration of stability in the region. Currently, there are over 3,000 US Army personnel deployed in Iraq. These soldiers have not been deployed in combat roles; instead, they provide training to the Iraqi Security Forces and help coordinate air strikes against ISIS positions. The patch will only be available for US Army soldiers. The other service branches of the military are also participating in Operation Inherent Resolve against ISIS but will reportedly not be receiving patches. " hi all, just wanted to see what peoples views are. i wonder if there plan is eventually to link up to Deir ez Zor in the east as its still isolated, i know Hasakah is a bit to far to reach. So whats peoples view on Assad's/Russia's/Iran's intentions for Syria????? create a split in the country with the west a new Syria or to take back whole of Syria???? my personal opinion is the first option is probably going to be the likely outcome, i suppose a third option would be for the Syrian government to make a deal with the Kurds tht if they help the Syrian government then they would promise them the eastern part of Syria that they could create there their own Kurdish state. (at the disgust of Turkey) only problem i can see with this option is turkey would more than likely want to invade and destroy the newly formed state, so maybe the Syrian government could allow to form a semi autonomous state within Syria. hi anyone seen this, i know its not the most reliable source. Dunno if you are still pissed at me, but I had to give you a +1 for that. As well, i did spread your message to major Canadian news site. Naaa man, i met ultron and Vann, after that i cant be pissed at anyone. Nice, sharing is caring. Anyway, fantastic posts! I am extremely impressed and well, saddened at the same time after reading CBC and the idiots who falls for the US Propaganda on this whole ordeal. Ty, doing my best, however finding legit sources is trouble these days in all this propaganda war mess, nets of lies and fake reports, photoshopped images and cutout videos..
And yeah, it is very sad that people fall for stuff that various "rebel", "democratic" and "freedom fighter" groups release and claim. d_taddei2 wrote: hi all, just wanted to see what peoples views are. i wonder if there plan is eventually to link up to Deir ez Zor in the east as its still isolated, i know Hasakah is a bit to far to reach. 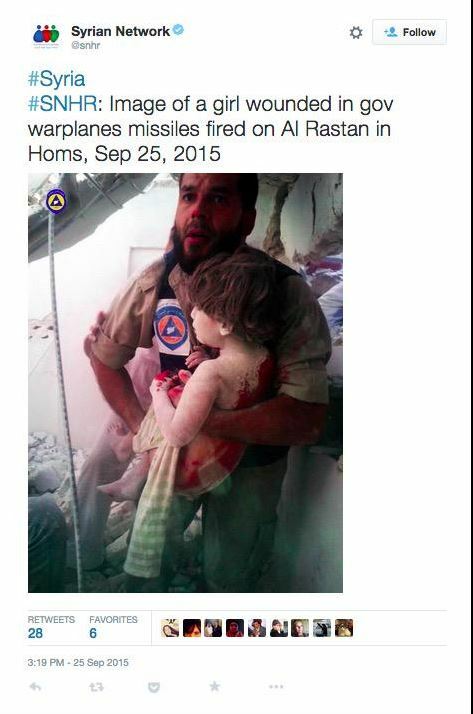 So whats peoples view on Assad's/Russia's/Iran's intentions for Syria????? create a split in the country with the west a new Syria or to take back whole of Syria???? Hi, I think you can find public RU statements saying their goal is a unified Syria. As far as eastern part of country, it seems that how the Iraqi war with ISIS proceeds will play a major part one way or another,` esp. longer term. But if ISIS is strongly engaged on both fronts, I see DeZ/Hasakah fronts not being a focus for either side and not changing much in shorter term. Removing ISIS from eastern flanks of Hama/Homs does allow re-establishing road to DeZ, but that doesn't mean DeZ front suddenly shifts or escalates. * Baghdad tension with Iran playing major part here, although new Russian role in anti-ISIS coalition presents new dynamic possibilities. I had believed a joint-ops center was being set up in Baghdad also, but that is apparently only intelligence sharing, not ops coordination. The Kurds are another aspect, and far from simple IMHO. Notably Russia has included them (PKK/YPG) in statements referring to their coalition. I think this must be considered in backdrop of Turkey, i.e. if TK escalates (directly/mujahideen) then RU supplies to PKK can be used "wherever". Kurdish role is rather ambiguous over all though, f.e. recent news from Aleppo involving their cooperation/"neutrality" with anti-Assad rebels (non-ISIS). I do think Russian role here will be important, as with Iraq/Hashd/Iran dynamic, being a more "neutral" 3rd party mediating solutions for conflictive groups.